At a church small group earlier this week, a middle-aged member approached me with a book in her hand. "This was in my mailbox today. Have you heard of it?" "Is it any good?" she asked. She walked over to a trash can and threw it in. Wow, I thought, that was fast! When I had time to reflect more on our brief encounter, I was both thankful and sobered. I was thankful that I had previously read up on The Great Controversy by Ellen White and knew it contains heretical teaching. 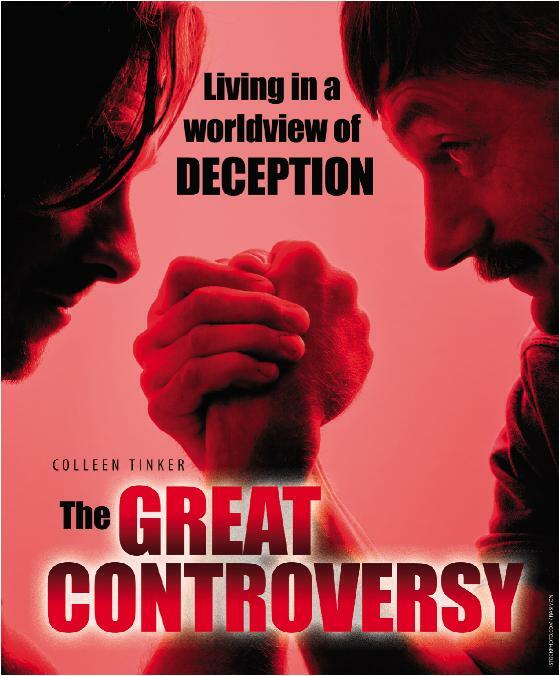 I also had read that the Seventh Day Adventist Church is doing a major campaign to mail millions of copies of this book to American homes this year. I was thankful to be asked a question to which I knew the answer. I was also sobered by the trust this woman placed in my judgment. The Holy Spirit gives Christians many different gifts, but we all have responsibility to help each other avoid sin and follow the truth. Which means we all (even "smart" people like me!) need to seek help and counsel from others. Following Jesus was never meant to be a solo sport. At a church small group meeting on Monday evening, a friend shared how she had gone to a funeral with a coworker. En route to the funeral, they had discussed what song they would like to have sung at their funeral. What a great question! Our deaths will be a great platform from which to proclaim Jesus to our family and friends. Don't squander your final "sermon" on songs and messages that present a fuzzy God who will let a man into heaven as long as he is kind to his friends, raises civilized kids, and doesn't cheat on his wife. This is also a great question to use in evangelism. When you ask people, "What song would you like sung at your funeral?" you'll gain insight into what they value in life. They'll probably ask you what song you would pick too--and this will give you an opportunity to share about Jesus. So what song have I picked? I am still trying to decide, actually! Expresses the gospel clearly: that Jesus, God in the flesh, died for sinners and rose from the dead, and that by trusting in Him and turning from sin we receive forgiveness of sins and a new heart. A couple years ago several friends came to me separately, excited about a new kind of grocery co-op called Bountiful Baskets. I finally decided to try it once -- and have not missed a delivery since then. Basically you pay a set price for a box or basket full of 6 kinds of fresh vegetables and 6 kinds of fresh fruit. You pay 4 or 5 days ahead of the delivery day, and you never know ahead of time what veggies and fruit they will be (I love being surprised). The types of produce vary with the season of the year, but two things are almost always true: you get fresher produce, and more produce for the money than you would get in a grocery store. And there was a side benefit: my health improved noticeably with the increased intake of fresh fruit and vegetables. I now buy the maximum number of baskets (3) as often as I can (they only come to my town once every 2 weeks). Besides the "surprise" baskets which are their core "product", Bountiful Baskets also offers a small and changing list of other food items at good prices. For example, I got a great deal on some organic extra virgin coconut oil last time. They also usually sell whole-grain bread at great prices. Bountiful Baskets is not available nationwide yet. But if they are in your area, I highly encourage you to try it out. A second way to save on groceries is through PracticalSaver.com. This site has a number of tips and tools for saving on household costs, but their flagship product, which I use, is their weekly newsletter. The newsletter surveys all of the major grocery stores in Arizona for the sales that are really noteworthy (not just over-inflated prices marked down to normal prices), and lists them in compact, easy to read charts. A lot of the "good" prices turn out to be on junk food that I wouldn't feed a pig--but there are still enough sales on items we do use to make the newsletter subscription ($25 a year) worth while. Try a two week subscription for free and see what you think. John MacArthur is no stranger to controversy. His interviews on Larry King Live and other programs were not marked by soft words. His books The Gospel According to Jesus and Charismatic Chaos had polarizing effects, to say the least. And yet, in his latest book Twelve Unlikely Heroes we see his gentler side. MacArthur profiles twelve mostly obscure Bible characters, drawing out remarkable insights from passages that seem scanty at first. Enoch, Joseph, Miriam, Gideon, Samson, Jonathan, Jonah, Esther, John the Baptist, James (the brother of Jesus), Onesimus, and Mark are all brought forward from the pages of Scripture in vivid, three-dimensional color. Even seasoned Bible students will have plenty of "Why-didn't-I-ever-see-that-before" moments reading this book. While the book contains plenty of information, there is very little application. MacArthur doesn't spend as much time exhorting his readers as we would expect from a book with "What He Wants to Do with You" in the subtitle. The basic message of the book seems to be: "God uses imperfect people; He can use you". But who really needs to be told that? I think most of us struggle more with expecting God to use us and being upset when He doesn't. It's the (rare) humble person who would be blessed most by this work; someone who honestly thinks their past failures or present weaknesses are inhibiting God from ministering through their life would find this book a refreshing spring. Disclaimer: I received this book for free from BookSneeze.com in exchange for writing this review. My review was not required to be positive.